by David Dry, copyright 2019. Published with permission. For personal educational use and not for further distribution. Willis Gustavus Borne, known professionally as “Billy Borne,” was an early 20th century newspaper cartoonist for the Asheville Citizen. Born on July 22, 1884, he grew up in Toledo, Ohio, and his career as a cartoonist began in February 1906 with the Kokomo Tribune in Indiana. In 1907, Robert S. Jones, a newspaperman from Indiana who had bought a controlling interest in the Asheville Citizen, brought Borne to Asheville as part of a larger restructuring of the newspaper. 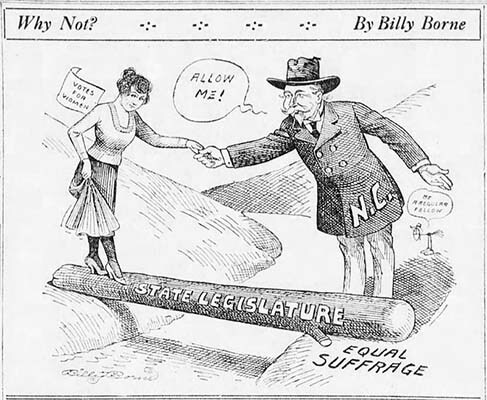 Borne's first cartoon in the Asheville Citizen debuted on July 2, 1907, and he worked as the editorial cartoonist for the newspaper for the next twenty-one years. While best known for his daily editorial cartoons, Borne’s artistic activities ranged far beyond. He produced illustrations for newspaper advertisements, briefly had a Sunday comic strip, and composed posters for the Asheville Health Department's “Swat That Fly” campaign that aimed to combat diseases spread by the common housefly. For World Series baseball games and Election Night returns, Borne drew caricatures and illustrated scenes live as breaking news came in over the wire. Using a stereopticon lantern, these images were projected on the wall in front of the office of the Asheville Citizen, and the events drew large crowds. Borne’s personal life was marked by tragedy. In 1918, an influenza pandemic, commonly known as the Spanish Flu, ravaged Asheville, and Borne’s fiancé succumbed, dying only days before they intended to wed. Years later, friends reflected that Borne never fully recovered. By the time he left the newspaper in August 1928, Borne had been working at the Asheville Citizen longer than anyone else on staff. He moved back to his hometown of Toledo, Ohio where he opened a studio and did advertising work for magazines. On May 19, 1944, while on a trip to visit his sister in Tulsa, Oklahoma, Borne passed away from a heart ailment. He is buried in Rose Hill Memorial Park Cemetery in Tulsa. Asheville Citizen, 6 July 1907, 2 November 1908, 8 November 1910, 11 September 1912, 7 March 1916, 8 March 1917, 5 July 1918, 2 November 1920, 30 November 1921, 14 May 1925, 16 March 1928, 19 July 1928. Asheville Citizen-Times, 21 May 1944, 4 October 1956, 17 July 1960. 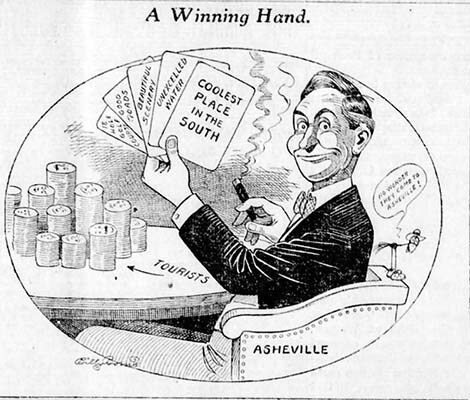 “A Winning Hand,” Asheville Citizen, 27 June 1915. “Why Not?” Asheville Citizen, 26 June 1920.